Japanese crucifixion scene, c 1853-1856. 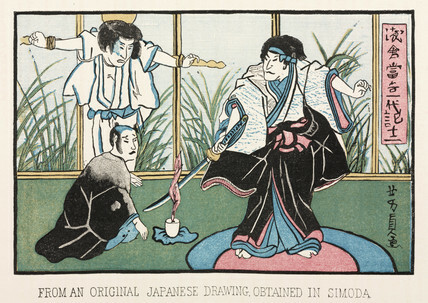 Lithograph after 'an original Japanese drawing obtained in Simoda'. Commodore Matthew Calbraith Perry (1794-1858) led a US government expedition designed to open up trade with Japan, which had been in self-imposed isolation for almost 200 years. The United States wanted to increase their trade routes in the western Pacific. They also wanted a coaling station for the new steam-powered ships of the US Navy. The illustrations, notes and journals kept by Perry and his officers were compiled by Francis L Hawkes and published as 'Narrative of the expedition of an American squadron to the China Seas and Japan : performed in the years 1852, 1853, and 1854 …', (Washington, 1856).